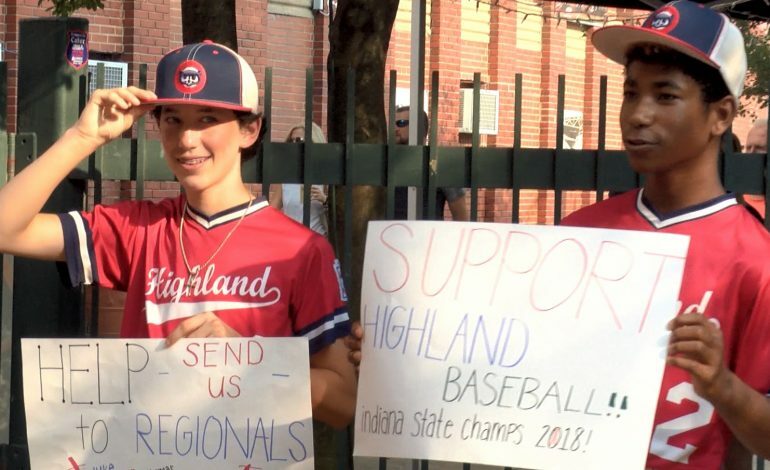 The Highland Baseball Club has seen multiple teams reach new heights in 2018 with its 12u and 14u teams reaching the state championship game. However, it was only the 14u team that came away with the state title for the first time in program history. Up next for the players is a trip to Fort Wayne, In. where the 14u squad battles the winning team from Illinois Saturday in the regional tournament. First pitch is at 3:30 p.m.
From there, HBC plays the host team from Indiana (St. Joe Little League) Sunday, Kentucky on Monday and Ohio on Tuesday. To raise money for the trip up-state, players from the 14u squad raised money inside the gates of Bosse Field prior to the Otters game. If you want to help fund the team’s trip, visit the program’s GoFundMe page or contact head coach Darren Cato at (812) 305-1357.